Submitted photo Kevin Lorson, director of Wright State University’s Physical Education Licensure Program, created the Health and Opioid Prevention Education (HOPE) curriculum. 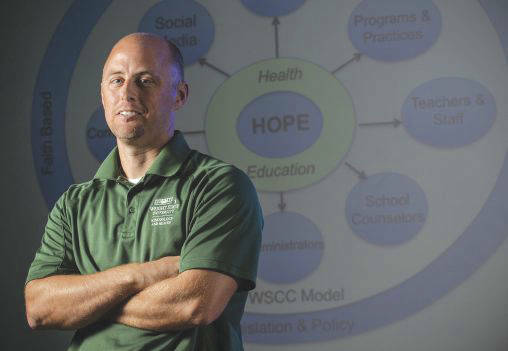 FAIRBORN — Kevin Lorson, professor and director of Wright State University’s Physical Education Licensure Program, will be honored with a Chancellor’s Award for helping create a statewide opioid prevention curriculum for Ohio schoolchildren. The award will be presented to Lorson at Wright State on April 17 by John Carey, chancellor of the Ohio Department of Higher Education. https://www.fairborndailyherald.com/wp-content/uploads/sites/50/2018/04/web1_kevin-lorson-18223_06-508×351.jpgSubmitted photo Kevin Lorson, director of Wright State University’s Physical Education Licensure Program, created the Health and Opioid Prevention Education (HOPE) curriculum.